Perhaps your current business is falling into a slump or you’re looking for ways to start up a business idea that doesn’t exist yet. Whatever your goal is, you know you’re going to need one vital element. Yes, that’s right, money. The saying about money making the world go round rings true in your mind and it is the only thing stopping you from creating your dream business. You often have ideas sprinkled around your brain but now you want to put it into action and actually start what you’ve been meaning to do for a long time. Improve your business or start a brand new one. The power is now in the palm of your hands so get ready for the ride and find your funding now. You have often been skeptical about borrowing money from loan companies as you’re worried you’ll be rejected for having a poor credit score or previous debts. The truth is, you longer need to worry as there are plenty of reputable companies out there who offer fast business loan for those with bad credit. You have the option to borrow as much or as little as you like, but make sure you’ve got a solid plan to pay the money back within the allocated time. Map out the financial plan for your business and feel confident that you can make a success story out of borrowing a small amount of money. You know that money that you’ve been saving for a rainy day? Well now is the time to actually put it to good use. Spending your hard-earned savings on a project that you’re passionate about is well worth it. If you don’t want to spend your money on your business then you may want to rethink your ideas until you reach a venture worth investing in. Your savings are precious, but they are also no good sitting in a bank account. Take the plunge and make that investment you’ve always wanted to make. Your loved ones have always been so supportive of your throughout your entire life, so what makes you think that this would be any different? Approach a handful of your most trusted friends and family members and pitch your business idea. You might be pleasantly surprised at their willingness to help you out with something that is really important to you. You should also prepare for some people to say, but don’t be offended. Often family members are fighting their own battles and lending money can sometimes add to this burden. If you are successful in borrowing money from somebody close to you, make sure you pay them back within a reasonable timescale so that you’re not deemed to be taking advantage of their kindness. Open up your business idea to the masses and ask for help from complete strangers. There are some amazing crowdfunding websites which can help you to kick-start your small business. The generosity of the people on your social media or your colleagues may astound you. Just a little contribution from a lot of people will help you to go a long way. You have a handful of options out there, so now take them on board and go with it. Your small business deserves to be built and you will soon have the income to make this happen. Have you ever wanted to design the home of your dreams? Building your own home can have several advantages. Rather than choosing a home that was built to the specifications of some else, you can plan the design to fit your needs. It is possible to save money by building a home. Everything in the home is new. Often people purchase a home, and within a few months, something breaks down and needs replacing. Some of these repairs can be quite expensive. In a new home, a warranty will be in place to cover this problem. One example of home builders in st. augustine fl is Collins Builders. Even if you find an existing home that meets your specifications, you will likely decide on certain upgrades. When building a new home, they can be incorporated into the plans from the beginning. This can save money on remodeling an older home. Building energy efficient is another plus when it comes to saving money. Most people have an area where they would prefer to live for various reasons. They may want to be near certain amenities or close to where they work for a shorter commute. Areas with good schools are a preference for families with children. When building your own home, you will likely find a variety of options available in the area you desire. Researching neighborhoods will help to ensure that the area where you choose to build is what you want. Even if you plan to stay there forever, you will want an area where the homes retain their value. From the size of the bathrooms to the type of counter tops, the storage space, and more, the home can be exactly as you choose. Your plans can include the number of bedrooms needed as well as the colors. The floor plan as well as the number of square feet desired is another advantage when building. Building also allows you to decide how the home will be positioned on the land purchased. If there is a view that you want to take advantage of, you can decide what part of the home overlooks this view. Incorporating natural elements such as trees around the home is possible as well. These are just a few of the reasons many people choose building a home rather than purchasing an existing one. Building your home from the ground up can provide a sense of accomplishment and satisfaction. Are There Advantages of Hiring Freelancers over Full Time Employees? When you’re starting out in business, your budget is going to be quite tight. No doubt you will have planned out your business strategy within an inch of its life, and know where every penny is going to go. But in many ways, having some staff on board is going to help your business to grow and progress you can’t do it all by yourself. There are many costs associated with hiring staff, though. From contributing to an employee pension to covering sickness or holiday pay, there are several things that are going to end up costing money with a full-time team. So have you thought of using freelancers instead? Here are some of the advantages of having a freelance team. You may have been looking on sites like businessloans.co to find the best lender for your startup. But do you want a lot of that cash to be spent on your team? If you’d rather be spending the money on growing the business and getting supplies, then freelancers can be much cheaper. Per hour, freelancers may cost a little more. However, you may only need them for ten hours a week, compared to a full-time staff member’s forty hours a week. So really, you are saving money, as you pay your full-time staff, regardless of how busy they are. One of the reasons that freelancer employees do what they do, is that they enjoy the flexibility of it all, and so should you! They can work on things at times that you wouldn’t want to, such as managing your social media at weekends, like the brand innocentdrinks.com do so well, or responding to emails out of hours. You could email things to do on a Friday, for example, and then by Monday, things could be underway. So it can make good business sense to hire freelancers. The kind of people that work freelance and make a success of it, are the kind of people with experience in what they are doing and in most cases, are experts in their field. They will know what you need them to do for things like blogs, web design, social media, accounts, or admin without you needing to explain. So the fact that they have such expertise is going to save you time and stress. As well as meaning that they get a good job done well. As they know what they are doing, they could even be quite innovative in what they choose to do, which can only be a good thing for your business. A freelancer will set their own hours, but as such, they are in a position to get work done in a timely manner. If you set a deadline, they know it needs to be done by then, so they can work flexibly to make it happen. They are self-motivated when they work in a role like this, and they know that a good job can mean repeat custom. So they are likely to get things done quicker than a full-time staff member that has several other things to be working on. Of all the life lessons you can teach your kids, managing money is possibly the most important. It’s something that isn’t taught in detail at school but could be extremely valuable to them as they reach adulthood. To teach your kids about money, you’re going to need to set an example. Take a look at some of the most valuable lessons to teach your kids about money below. Learning how to save is a valuable lesson. With so much emphasis today on having things ‘now,’ it’s no wonder that so many people get themselves into debt so easily. Teaching your kids to save for things that they really want, such as their saving their allowance for a new game or item of clothing can teach them a lot about the value of money later on. While this might involve saying ‘no’ a lot, there are some ways you can say ‘no’ without actually having to say it. Budgeting is a useful skill to have, particularly when you have a family. Even if you’re comfortable, it doesn’t hurt to have a budget that allows you to account for your outgoings, your savings as well as what disposable income you have left. Teach your kids what it takes to manage an income, starting with their part-time job. It also helps to demonstrate more frugal behavior around your children so that they can learn habits that will save money. Try not to adopt any wasteful habit that they could carry with them into adulthood. Debt can be inevitable, especially when it comes to buying a car or large purchases for your home. While you can teach them how to avoid debt through saving and budgeting, there will be times where they may need to deal with debt. By handling your own debts responsibly, you can teach them some great lessons. Rather than flaunt the use of credit cards or store cards, teach them how to use them responsibly. Remember that if you do struggle with your own debts, there are debt settlement companies that could help you to get your debts under control. Rather than letting your debts get the better of you, finding solutions for clearing them will set a great example for your children. Whether for convenience or laziness, many of us are guilty of accepting the first offer. However, the possibilities of the internet mean that you can save money on almost everything you buy. From flights to insurance, help to teach your kids how to find a discount online. Once you get into the habit of it, it becomes simple to find a great deal online and a great lesson to pass on to your children. Teaching lessons about money is important, especially as they head off to college or start work. Show them a good example by managing your own finances responsibly and help set your kids to learn what it takes to shape a secure financial future. Debt is something that all of us come into at some point in our lives. Whether it be something small and being unable to pay for anything because your bank has gone slightly overdrawn, or whether you have found yourself in hundreds or even thousands in debt, it can be distressing for anyone experiencing it. One thing that we are never taught in school is how to manage money, so it’s up to your parents to do the teaching. However, if they’ve not had any advice and aren’t great with money themselves then this can be unhelpful. Here’s some smart money tips for you to take on and get yourself out of debt and back into the clear this year! A bit late to say that now, you may be thinking? This is more of a tip for people that find themselves often a bit short of money. Saving even the change you get from your grocery shopping and putting it in a jar will mount up much faster than you think. So, when you’re a bit strapped for cash towards the end of the month you can dip into these savings to buy essentials that you need. Putting away a percentage of each paycheck into the bank is also a great way of knowing that if you come into a spot of financial bother, then you will have some money to fall back on. Try and adopt this habit so that you don’t find yourself in any sticky situations in the future. This is a fabulous option for those that have debts dotted all over the place, or even one large debt because it allows you to pay off your debt with and put it into one single loan that you pay off at an affordable rate. Even people with bad credit can get a bank loan, so if you’re wondering how you’re going to be able to pay off all of your debts then this might be the choice for you. Just make sure that you can afford the repayments every month or you could land yourself in even more trouble than you started with. Speak to all of your utility and service providers to see if they can offer you cheaper deals on your services. It’s likely that they will have an offer on at the time that will be cheaper than what you’re currently paying. Also, the threat of losing a customer will often make them lower their prices! Definitely worth a try, and it’s also something you should keep an eye on to see if you’re on the lowest deals possible! Finally, make sure that you know every single thing that’s going out and coming in of your bank at all times so that you can budget on food and luxuries without worrying that you will overspend accidentally. This will help you stay on top of your money at all times! Here’s to a debt free 2018! So, you can already talk the talk when it comes to your money and financial situation. But are you and your money able to walk the walk? You will get to a point in your adult life where you will need to have got everything together. Otherwise, your whole financial situation will be very shaky indeed and the slightest upset could set your life off cause and you could plunge into some financial difficulties.. So, where exactly should you be right now with your money? Here’s a roundup of what you need to do with your money each decade to ensure that it starts to walk the walk. Once you leave college and get your first proper job, you need to start saving like crazy. There are lots of things to save for a deposit to put down on your first property, an emergency fund that you can use for any unexpected bills and repairs, and just some savings that you can use on a rainy day. If you can afford to, it’s also a good idea to set up a private pension plan as well to ensure that you are all set for retirement. Haven’t had such a productive decade with your money in your twenties? If not, then you should work on improving things once you hit thirty. It’s worth taking a look at some credit repair services reviews so you can get your financial status sorted as soon as possible. Once everything is back on track, you can start topping up your savings and house deposit. If you are lucky enough, you might not be far off buying your first property! If you don’t already have a pension for retirement, you really need to get one now. Unfortunately, though, it will now be very expensive as you try to make up for all that time you haven’t been paying anything in! Not only that, though, but now is a good time to increase your investment portfolio. If you don’t already have a portfolio, you should think about investing in the stock market to help your savings get higher returns. This will be a lot more profitable compared to simply leaving your savings in the bank just gathering some measly interest. Once you are over the age of fifty, you should hopefully have used your money wisely. At the very least, you need to have a pension and some investments in place. One of those investments could be in property, but that doesn’t necessarily have to be so. As long as you don’t just have your money in a bank account - it really is key to diversify so that you can maximize any growth that you receive on your investments. Not only that, though, but diversifying helps to lower the overall risk of your investments. Hopefully, you’ve taken a look at this article and are nodding away. If not, don’t worry - there's still plenty of time to bring your finances up to speed! I know most of us had our holiday shopping last month and shopping for clothes, shoes and etc is definitely not in our priority list this time. 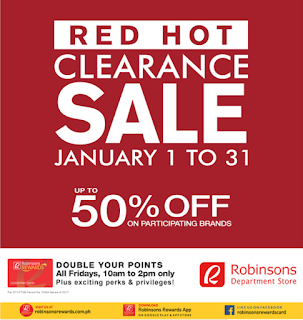 But what would you do if you received an e-mail from Robinson’s Mall announcing the its Red Hot Sale up to 50% discount on selected item. For sure, like me you will be tempted to check it out. Good thing I need to buy something. Hopefully the items that I need to buy is also on sale. As I have mentioned in my other I am trying the saving challenge I found online so spending too much for an item that I might not be using for long it is not practical. Anyway go back to my main topic. 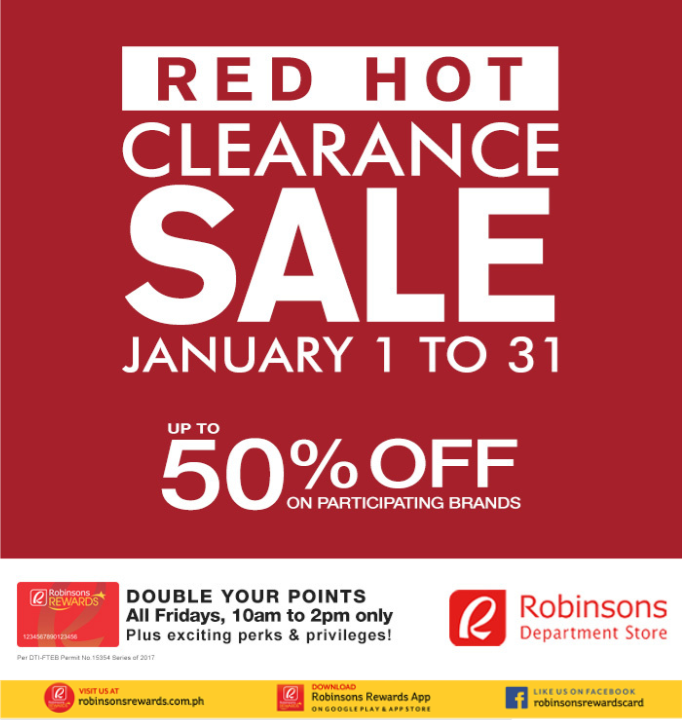 If you shop using your Robinsons Reward card on Friday from 10 in the morning till 2 in the afternoon your reward point will be double plus some exciting perks and privileges. So guys in your near Tacloban City you might want to check out Robinsons Mall Tacloban every Friday. Enjoy shopping!! !